6.1 Which is the highest point? Located in the Pacific Ocean, Cocos Island is roughly 550 km away from the Costa Rica mainland. The island was declared a National Park in 1978 and only park rangers are allowed to live here. This rather rectangular shaped island is roughly 8 km x 3 km, with a perimeter of slightly more than 23 km. It is surrounded by deep waters characterized by counter-currents. The climate is extremely wet and the ecological character of Cocos Island differs sharply from that of other islands in the region, such as Malpelo, Gorgona, and the Galápagos Islands. Cocos Island is the only emergent island of the Cocos Plate, a minor tectonic plate named after the island, and it is also the only oceanic island in the eastern Pacific that is covered in tropical moist rainforest. Cocos Island has never been linked to a continent, and this permanent isolation has of course had a huge impact on which flora and fauna that has managed to reach the island and establish itself here. 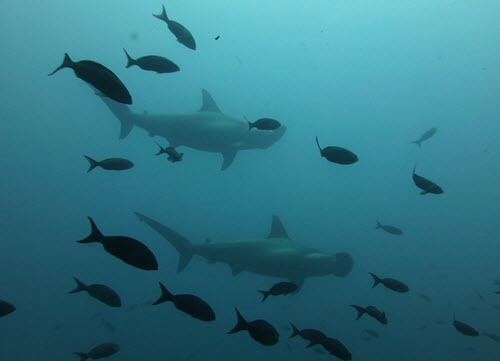 The waters around Cocos Island is frequented by large marine animals such as dolphines, rays and sharks, it is not suprising that diving here is on the wish-list of many scuba divers around the world. The meeting between deep and shallow water attracts huge schools of hammerhead sharks, and the island is the focal point of one of the most extensive coral reefs in the south-eastern Pacific. For more information about the nature and wildlife on and around Cocos Island, go to our article Cocos Island Nature. The fictional island Isla Nublar of the Jurassic Park franchise was modeled after Cocos Island, and in the video game Jurassic Park:Trespasser the player is shown a map of “Isla Nublar” that is actually a map of Cocos Island. 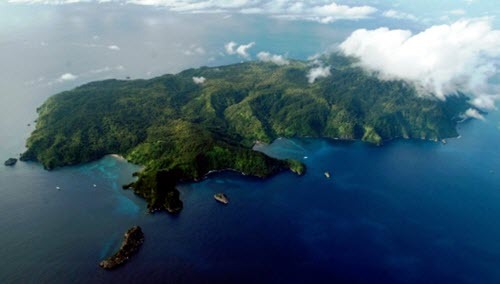 Cocos Island is an UNESCO World Heritage Site based on criteria Natural: ix, x. It was included in the UNESCO World Heritage list in 1997. In 2002, the size of the World Heritage Site was extended to include an expanded marine zone of 1,997 square kilometers. Setting foot on Cocos Island is not allowed without a permit. The best point of entry is Chatham Bay. There are no tourist facilities on the island such as hostels or tourist camp grounds, since no one is allowed to stay here overnight except for the rangers. Many visitors arrive onboard dive boats that they live on, and quite a few never set foot on the island – preferring to enjoy the waters around it instead through swimming, snorkling and scuba diving. There are no cars on Cocos Island. The rangers have access to small motor bikes, dirt bikes and ordinary bikes, but mainly get around on foot. For tourists, walking or biking are the main modes of getting around. Collecting or otherwise harming flora, fauna or minerals is strictly forbidden. This is true for both land and sea. Treasure hunting used to be allowed here if you had a permit, but that is no longer the case – no such permits are issued anymore and treasure hunting at Cocos Island has been outlawed completely. In the past, numerous treasure hunters were attracted to the island since it features in many old pirate tales. According to one widespread story, the hoard of Benito Bonito is hidden here, and the island has also been associated with the stolen Treasure of Lima. Cloudiness, high humidity and lots of rain characterize the weather here year round, chiefly due to the latitudinal movement of the Intertropical Convergence Zone. The average annual precipitation exceeds 7,000 mm, with April through August and November through December being especially rainy. The temperature is tropical, averaging above 26 degrees C in a normal year. Cocos Island is of both volcanic and tectonic origin, and the oldest tested rocks here have been dated to between 1.91 million and 2.44 million years ago, which is the Late Pliocene period. The island consists chiefly of basalt, an extrusive volcanic rock formed by basaltic lava that cooled very rapidly. The soils are highly acidic. Without the dense forest coverage, erosion would be rampant here, due to a combination of soil type, heavy rainfall and steep slopes. Cocos Island is characterized by irregular mountainous terrain, with flatter areas located at an elevation of 200-260 meters in the central part of the island. Much of the island’s edge feature 300-foot cliffs, making the island difficult to access. There are four bays, of which three are found to the north: Chatham, Weston and Wafer. Of these, Chatham is the best for landing on the island. Which is the highest point? The highest point on Cocos Island is Cerro Iglesias, at an altitude of 575.5 meters. Cocos Island has a number of short rivers and streams. The main rivers are Genio and Pittier, which empty into Wafer Bay on the north side of the island. There are over 200 waterfalls on Cocos Island.